Overtime is a method of determining a winner in an ice hockey game when the score is tied after regulation. The main methods of determining a winner in a tied game are the overtime period (commonly referred to as overtime), the shootout, or a combination of both. If league rules dictate a finite time in which overtime may be played, with no penalty shoot-out to follow, the game's winning team may or may not be necessarily determined. A scoreboard showing an overtime period. Since there are typically three periods in hockey, the fourth period is the overtime period. Overtime periods are extra periods beyond the third regulation period during a game, where normal hockey rules apply. Although in the past, full-length overtime periods were played, overtimes today are golden goal (a form of sudden death), meaning that the game ends immediately when a player scores a goal. From November 21, 1942, when overtime (an extra period of 10 minutes duration) was eliminated due to war time restrictions and continuing until the 1983–84 season, all NHL regular-season games tied after 60 minutes of play ended as ties. On June 23, 1983, the NHL introduced a regular-season overtime period of five minutes. If the five-minute overtime period ended with no scoring, the game ended as a tie. (The World Hockey Association had used a 10-minute, sudden death regular season overtime period during its seven-year existence.) In the first games to go to overtime, on October 5, 1983, the Minnesota North Stars and Los Angeles Kings skated to a 3–3 tie, and the Detroit Red Wings and Winnipeg Jets tied 6–6. The first regular-season game decided by overtime was on October 8, 1983, as the New York Islanders beat the Washington Capitals 8–7. In 1987–88 and since 1995, the American Hockey League has awarded teams one point in the standings for an overtime loss (OTL). In 1998, the AHL introduced a rule where teams will play the five-minute overtime period with four skaters and a goaltender, rather than at full strength (five skaters), except in two-man advantage situations. In a two-man advantage situation, the team with the advantage will play with five skaters against three skaters. The rule was popular and adopted by the NHL and ECHL the next season. Alex Ovechkin has the record for most NHL overtime goals with 20. In the Stanley Cup playoffs and in all one-game playoffs, overtime periods are played like regulation periods except for the golden goal rule – in an overtime period, the game ends when one team scores a goal; the teams are at full strength (five skaters, barring penalties), there is no shootout, and each overtime period is 20 minutes with full intermissions between overtime periods. Three of the game's legendary players, Mark Messier (109 playoff goals), Mario Lemieux (77 goals), and Gordie Howe (68 goals) never scored a playoff overtime goal. In many leagues (including the NHL for regular-season games since the 2005–06 season) and in international competitions, a failure to reach a decision in a single overtime may lead to a shootout. Some leagues may eschew overtime periods altogether and end games in shootout should teams be tied at the end of regulation. In the ECHL, the AHL, and the Southern Professional Hockey League, regular season overtime periods are played three on three for one five-minute period, with penalties resulting in the opponents skating one additional player on ice (up to two additional players) for each penalty. Prior to the 2014–15 season, the AHL set the overtime period at seven minutes, but reverted to the now-standard five-minute period the following year. The idea of using 3-on-3 skaters for the entirety of a five-minute overtime period for a regular season game was adopted by the NHL on June 24, 2015, for use in the 2015–16 NHL season. In IIHF play, rules for overtime depend on the stage of the competition. For a round robin or preliminary round game that goes to overtime, the teams will play a maximum of 5 minutes of 3-on-3 hockey in the "golden goal" format. If no one scores in the five minute overtime, a three-round shootout will decide the winner. In the case of a playoff game or a bronze medal game, the teams will play a maximum of 10 minutes of 4-on-4 hockey in the "golden goal" format. If there is no score in the overtime, a five-round shootout will decide the winner. If the gold medal game of a top category IIHF championship goes to overtime, the teams will play a maximum of 20 minutes of 5-on-5 hockey in the "golden goal" format. If there is no winner after the overtime, a five-round shootout will decide the winner. In all cases, the teams must change ends, and defend the same side that they did in the second period. New overtime procedures will be used at the 2019 IIHF World Championship: all overtime periods will be 3-on-3 throughout the entire tournament, maintaining the same period lengths as before. However, the gold medal game will no longer go to a shootout: games will continue in 20-minute periods until a winning goal is scored. Peter Mueller of the Arizona Coyotes (white jersey) scoring a shootout goal on Evgeni Nabakov of the San Jose Sharks (green jersey). Jason Williams of the Detroit Red Wings attempting a shootout shot on Marc-André Fleury. In international competition, shootouts (or more formally, game-winning shots (GWS), and, in some European countries, bullets, or bullits), are often used. Each coach selects three skaters from their team to take penalty shots one at a time against the opposing goaltender, with teams alternating shots. Each team gets one shot per round. The winner is the team with more goals after three rounds or the team that amasses an unreachable advantage before then (ex. a team gains a two-goal lead with only one round left). If the shootout is tied after three rounds, tie-breaker rounds are played one at a time (with each team taking one additional shot) until there is a winner. The IIHF first adopted the game-winning-shot procedure in 1992 when a new playoff procedure in the Winter Olympics and World Championships required a winner for each game. At that time, the shootout was five rounds and only used for knock-out games. In 2006, it was reduced to three rounds and used for all games, eliminating the possibility of tied games at IIHF events. Tie-breaker rounds are still used as needed, and the same or new players can take the tie-break shots, which is also done in reverse order. As of May 2016, all IIHF preliminary round games that are not decided by overtime, are decided by a three-round shootout. However, all playoff, bronze medal games and gold medal games of IIHF top level championships (especially the Olympics) are decided by five round shootouts. Most lower minor leagues (ECHL, Central, UHL) have featured a shootout where, at the end of regulation, a shootout similar to the international tournament format is used. However, in 2000, the ECHL adopted the AHL's four-on-four overtime before the shootout. For the 2004–05 AHL season, the AHL adopted a five-man shootout, which was first used in that league in 1986–87. The standard five-man shootout is used after four-on-four overtime for all minor leagues in North America. The AHL switched to the NHL formatted three-man shootout for the 2014–15 season. The Central Collegiate Hockey Association added the shootout as of the 2008–09 season. Following the lead of minor leagues, as of the 2005–06 season, the NHL ends exhibition and regular season games still tied after a five-minute-length, three-skaters-per-side overtime period (as of the 2015–16 NHL season onwards) with a shootout. The NHL format is a three-round shootout with tiebreaker rounds as needed. All skaters (except goalies) on a team's roster must shoot before any player can shoot a second time. On December 16, 2014 the longest shootout in NHL history went to 20 rounds before Nick Bjugstad of the Florida Panthers scored to defeat the Washington Capitals; the previous record was 15 rounds. The shootout is not used in the playoffs for any North American league. Instead, full 20-minute overtime periods are played until one team scores a goal. In the National Hockey League and American Hockey League All-Star Skills Competitions, the competition ends in a penalty shootout known as the Breakaway Relay. Tactics are very important during penalty shots and overtime shootouts for both the shooter and the goalie. Both shooters and goalies commonly consult their teammates and coaches for advice on the opposing player's style of play. Shooters often consider the goalie's strengths and weaknesses (such as a fast glove or stick save), preferred goaltending style (such as butterfly or stand-up) and method of challenging the shooter. Goaltenders often consider the shooter's shot preference, expected angle of attack, a patented move a shooter commonly uses and even handedness of the shooter. Most shooters attempt to out-deke the goalie in order to create a better scoring chance. Former Detroit Red Wings forward Pavel Datsyuk and New York Rangers forward Martin St. Louis are examples of players who commonly use this tactic. However, it is not uncommon for a shooter to simply shoot for an opening without deking. This is commonly referred to as sniping. This is most commonly performed when a goalie challenges a shooter by giving them an open hole (by keeping a glove, pad or stick out of position or being out of sound goaltending position altogether to tempt the shooter to aim for the given opening). Former NHL forwards Markus Näslund and Brett Hull are two players commonly referred to as snipers. Very rarely a shooter may take a slapshot or wrist shot from the point or top of the slot. This is almost exclusively performed when a shooter either has a high level of confidence in their shot or they attempt to catch the goalie by surprise. Retired player Brian Rolston, Detroit Red Wings winger Todd Bertuzzi, Philadelphia Flyers defenseman Chris Pronger, and Vancouver Canucks winger Daniel Sedin have all used this tactic with success. The longest overtime game in history was an in Norwegian GET-ligaen. The game ended after 157:14 of overtime, in the 8th overtime period. This is a list of all National Hockey League (NHL) overtime games that went into at least three overtimes (winning team is bold). March 24, 1936: The Detroit Red Wings' Mud Bruneteau ends the longest Stanley Cup playoff game to date, scoring the game's only goal in a 1–0 victory over the Montreal Maroons. The goal comes at 16:30 of sextuple overtime for a total of 176:30 of game play. It is also the longest NHL ice hockey game ever played. The game is a mere 3:30 short of the equivalent of playing three games back-to-back-to-back. February 4, 1939: The Boston Bruins' Mel Hill scores his third overtime goal of the Bruins' Stanley Cup semi-final series against the New York Rangers, setting an unsurpassed (as of now) NHL record for most overtime goals in a single playoff series, earning him the nickname thereafter of "Sudden Death" Hill. The series itself involves four overtime games, two of which go to triple overtime. April 23, 1950: Pete Babando scores at 8:31 of double overtime to give the Detroit Red Wings a 4–3 win in the seventh game of the 1950 Stanley Cup Finals over the New York Rangers. It is the first time that a seventh game of a Final series goes to overtime. April 21, 1951: Bill Barilko scores at 2:53 of overtime to give the Toronto Maple Leafs a 3–2 win in the fifth game of the 1951 Stanley Cup Finals over the Montreal Canadiens. All five games in the series need to have overtime to be decided. Barilko was killed in a private plane crash in a remote part of northern Ontario a few months later. April 16, 1954: Tony Leswick's shot hit Montreal Canadiens' defenceman Doug Harvey's glove and went into the net at 4:20 of overtime to give the Detroit Red Wings a 2–1 win in the seventh game of the 1954 Stanley Cup Finals over the Canadiens. No seventh game of a Final series has gone to overtime since. April 23, 1964: Bobby Baun of the Toronto Maple Leafs nets a game winner against Detroit 1:43 into overtime in game six of the Finals to tie the series 3–all. The goal is notable because Baun broke his ankle earlier in the game. It was frozen and taped, and Baun returned to the ice to score the winning goal. May 10, 1970: One of the most indelible moments in sports history is the sight of Bobby Orr's "in flight" goal that gave the Boston Bruins a 4–3 win and a four-game sweep of the St. Louis Blues in the Stanley Cup Finals. May 24, 1980: Bob Nystrom of the New York Islanders scores the Stanley Cup clinching goal at 7:11 of overtime, beating the Philadelphia Flyers in six games for the title. April 14, 1981: After sitting on the bench for the entire game, Mike Crombeen scored the winning goal at 5:16 of double overtime to give the St. Louis Blues a 4-3 win over the Pittsburgh Penguins. April 10, 1982: "Miracle on Manchester" – Rookie Daryl Evans gives the Los Angeles Kings a 6–5 win over the Edmonton Oilers at 2:35 of overtime. The Kings had trailed the Oilers 5–0 after the second period of game three of the Smythe Division Semi-final. This still remains the largest single game playoff comeback in NHL history. May 5, 1986: Doug Wickenheiser's overtime goal gives the St. Louis Blues a 6–5 win over the Calgary Flames in game six of the Campbell Conference Final. The goal, known as the "Monday Night Miracle", caps a 5–2 comeback and makes it more impressive that the three goals needed to tie the game were scored in the last ten minutes of the third period. May 18, 1986: A Brian Skrudland goal ends the shortest overtime in NHL history at just nine seconds. The winning goal gives the Montreal Canadiens a 3–2 victory over the Calgary Flames in game two of the 1986 Stanley Cup Finals. April 18, 1987: "Easter Epic" – Pat LaFontaine of New York Islanders scores a goal against Washington Capitals at 8:47 of quadruple overtime which ends the longest game seven in NHL playoff history. Islanders goaltender Kelly Hrudey makes a record 73 saves. May 15, 1990: After hardly playing in overtime, Petr Klima came off the bench late in triple overtime and scored almost immediately to end the longest overtime in NHL Finals history, with 4:47 left. The goal gave the Edmonton Oilers a 3–2 victory over the Boston Bruins to open the 1990 Stanley Cup Finals, setting the stage for the Oilers' fifth cup in seven years. April 24, 1993: In game four of the Adams division semi-final between the Buffalo Sabres and the Boston Bruins, Sabres forward Brad May scores in overtime to give Buffalo a 6–5 win and sweep the Bruins in the series, four games to none. Due to Buffalo commentator Rick Jeanneret's colorful play call when May scored, this game has been referred to in Buffalo as "May Day". April to June 1993: After losing in overtime of game one of the Adams division semi-final to the Quebec Nordiques, the Montreal Canadiens go on to win ten consecutive overtime games en route to winning the Stanley Cup. The Habs score another overtime winner the following year against the Boston Bruins, making it eleven consecutive playoff overtime wins. May 14, 1993: In game seven of the Patrick Division Finals, David Volek who spent most of the season as a healthy scratch, scored the series winning goal to give the New York Islanders a 4-3 victory ending the Pittsburgh Penguins chances at a threepeat. April 27, 1994: Dominik Hašek of the Buffalo Sabres stops all 70 shots produced by the New Jersey Devils as Dave Hannan scores the lone goal over a sprawling Martin Brodeur at 5:43 of quadruple overtime in game six of the Eastern Conference quarterfinal matchup. April 30, 1994: Pavel Bure scores 2:20 into double overtime of the seventh game of the opening round of Vancouver's playoff series with Calgary. The win gives the Vancouver Canucks three consecutive overtime wins over the favored Calgary Flames, who squander a 3–1 series lead. May 27, 1994: Stéphane Matteau scores the game-winning goal at 4:24 of double overtime with a wrap-around, beating Martin Brodeur and the New Jersey Devils in game seven, advancing the New York Rangers to the Stanley Cup Finals (where they would ultimately win it for the first time since 1940). It is Matteau's second goal in double overtime periods of the series. April 24, 1996: Petr Nedved scores with 44.6 seconds remaining in quadruple overtime to give the Pittsburgh Penguins a 3–2 win over the Washington Capitals to tie their Eastern Conference quarter-final series at two games apiece. June 6, 1996: Uwe Krupp became the 12th player in NHL history to end the Stanley Cup Finals in overtime, scoring a goal at 4:31 of triple overtime, giving the Colorado Avalanche a 1–0 win and a sweep of the Florida Panthers. June 19, 1999: Brett Hull scores with 5:09 left in triple overtime of game six to win the Stanley Cup for the Dallas Stars over the Buffalo Sabres. The goal is considered controversial by some fans due to disagreement on if the goal by Hull was legal or not. (see 1999 Stanley Cup Finals). May 5, 2000: Keith Primeau of the Philadelphia Flyers put a shot over the left shoulder of Pittsburgh Penguins goaltender Ron Tugnutt with 7:59 left in quintuple overtime, ending the longest game since 1936. June 6, 2000: Jason Arnott scores on Dallas Stars' goalie Ed Belfour in double overtime of game six to give the New Jersey Devils their second Stanley Cup. April 12, 2007: Roberto Luongo, goaltender for the Vancouver Canucks, wins his first career playoff game while making 72 saves, one shy of Kelly Hrudey's record. The game is the sixth longest ever, going into quadruple overtime. Henrik Sedin scores the winning goal in the Western Quarterfinals, beating the Dallas Stars 5–4 in game 1. The game is Vancouver's longest in history, and the Star's second longest, behind their five-overtime loss to Anaheim in 2003. May 5, 2008: Brenden Morrow scores on San Jose Sharks goalie Evgeni Nabokov at 9:03 of quadruple overtime in game six of the Western Conference Semi-final between the Sharks and Stars. The game sees an incredible goaltending duel as Nabokov makes 53 saves in the loss while Marty Turco of Dallas makes 61 saves for the win. June 6, 2008: In game five of the 2008 Stanley Cup Finals, the Pittsburgh Penguins' Petr Sykora told Pierre Maguire of NBC that he would score the winning goal in overtime. At 9:57 of triple overtime, Sykora scored on Detroit Red Wings' goaltender Chris Osgood and sent the series back to Pittsburgh for game six. June 6, 2010: Patrick Kane of the Chicago Blackhawks shoots a goal past Philadelphia Flyers goalie Michael Leighton 4:10 into overtime of game six of the Stanley Cup Finals to give the Blackhawks a 4–3 win over the Flyers for their first Stanley Cup Championship since 1961. April 26, 2011: Alexandre Burrows of the Vancouver Canucks scored at 5:22 of overtime past Corey Crawford of the Chicago Blackhawks to win the series 4–3 and the game 2–1, sending the Canucks to the Western Conference Semifinals, avoiding squandering a 3–0 series lead and a 1–0 lead in game seven in the third period. June 6, 2011: Another Burrows goal ends the second-shortest overtime in NHL history at just eleven seconds. The winning goal gives the Vancouver Canucks a 3–2 victory over the Boston Bruins in game two of the Stanley Cup Finals. May 25, 2012: Adam Henrique of the New Jersey Devils scored at 1:03 into overtime past Henrik Lundqvist of the New York Rangers in game six of the Eastern Conference Final to send the Devils to the Stanley Cup Finals for the first time since 2003. May 13, 2013: Patrice Bergeron of the Boston Bruins scored at 6:05 of overtime past James Reimer of the Toronto Maple Leafs to win the series 4–3 and the game 5–4, to send the Bruins to the Conference Semifinals to face the Rangers. It also capped a historic comeback in a game seven, coming back from a three-goal deficit in the third period. With fifty–one seconds to go, they tied the game. The tying goal was also scored by Bergeron. The 2012–13 Boston Bruins became the first team in NHL history to do so in the Stanley Cup playoffs. June 6, 2013: Andrew Shaw scored with 7:52 left in triple overtime as the Chicago Blackhawks beat the Boston Bruins 4-3 to open the Stanley Cup Finals, ending the fifth-longest game in Stanley Cup Finals history. June 13, 2014: Alec Martinez took a rebound off a Tyler Toffoli shot blocked by Henrik Lundqvist and scored with 5:17 left in double overtime in game five of the 2014 Stanley Cup Finals, becoming the 16th player to win the Stanley Cup with an overtime goal as the Los Angeles Kings beat the New York Rangers 3–2, clinching the title 4–1 in the longest game in Kings history to that point (total game time 94:43). He became the first player to score two series-clinching playoff overtime goals in the same season since Martin Gelinas in 2004; on June 1, he scored 5:47 into overtime to defeat the Chicago Blackhawks 5–4 in game seven of the Western Conference Finals. May 13, 2015: Derek Stepan scored with 8:36 left in the first overtime in game seven in the Eastern Conference Second Round against the Washington Capitals to send the New York Rangers to the Eastern Conference Finals. The Capitals also had a 3–1 series lead before losing the final three games and ultimately losing the series. May 19, 2015: Marcus Kruger scored with 3:48 left in the third overtime in game two of the Western Conference Finals, as the Chicago Blackhawks beat the Anaheim Ducks, 3–2, tying the series at 1–1. This was Anaheim's first playoff loss at home that season and Chicago's longest overtime game to date. Chicago goalie Corey Crawford made 60 saves while defenceman Duncan Keith played seconds shy of 50 minutes on ice. Earlier in the second overtime period, Andrew Shaw used his head to direct the puck into the net, but the goal did not count. April 24, 2016: John Tavares scored the series-winner with 9:19 left in double overtime in game six of the Eastern Conference First Round as the New York Islanders won a playoff series for the first time since 1993, beating the Florida Panthers 2–1, to win the series 4–2. He beat Roberto Luongo off a rebound of his own shot with a wraparound. It ended the longest home game in Islanders' history. Tavares also scored with 53.2 seconds left in regulation to force overtime. Three of those games in this series have gone to overtime, this and game five needed two. May 6, 2016: Mike Fisher scored with 8:48 left in triple overtime in game four of the Western Conference Second Round as the Nashville Predators beat the San Jose Sharks, 4–3, to tie the series at two games all. His goal ended the longest playoff game in Predators' history. Joe Pavelski could have won it at 7:34 of overtime, but officials waved it off as he crashed into Pekka Rinne, pinning him down before the puck crossed the goal line. May 25, 2017: Chris Kunitz scored at 5:09 of double overtime as the Pittsburgh Penguins beat the Ottawa Senators to advance to play the Nashville Predators in the Stanley Cup Finals in winning game seven of the Eastern Conference Finals, 3-2. Sidney Crosby sent a soft backhand pass to Kunitz, whose knuckling shot beat Craig Anderson from the right faceoff circle. April 13, 2018: The Vegas Golden Knights won their first-ever playoff overtime game when Erik Haula scored with 4:37 left in double overtime to beat the Los Angeles Kings 2–1 to take a 2–0 lead in the Western Conference First Round. Haula made it to the right wing after a James Neal pass, faked his shot, then beat Jonathan Quick with a forehand. May 7, 2018: Evgeny Kuznetsov scored at 5:27 of overtime as the Washington Capitals eliminated the two-time defending champion Pittsburgh Penguins in game six of the Eastern Conference Second Round to advance to the Conference Finals for the first time in 20 years. Alexander Ovechkin passed the puck back to Kuznetsov, who tapped it away from Sidney Crosby on a turnover before beating Matt Murray between the pads. April 21, 2019: Tomas Hertl scored the first ever short-handed overtime goal in a multiple overtime game in Stanley Cup playoff history with his goal at 11:17 in double overtime to beat the host Vegas Golden Knights 2–1 to force a seventh game in the Western Conference First Round. Sharks goalie Martin Jones saved 58 of the Knights' 59 shots, a Sharks playoff game record. This is a list of the longest games in the highest Swedish leagues. This is a list of Kontinental Hockey League games that went to at least the third overtime. The longest game in Belarusian extraleague is game first of the 2015 Semi-finals on March 7, 2015. Yunost Minsk beat the HK Gomel, 2–1, at Gomel Ice Palace of Sports on a goal by Vitaly Kiryuschenkov at 5:11 of the sixth 20-minute overtime period. Alexander Tsetkovsky was the winning goaltender for the Yunost, making 107 saves. This is a list of Gold Medal men's games from the Olympics that needed overtime. This is a list of Gold Medal women's games from the Olympics that needed overtime. March 22, 2008: Philip Gogulla of the Cologne Sharks ends the longest German hockey game ever and the third longest worldwide, scoring the ninth-overall goal in a 5:4 victory over the Mannheim Eagles. The goal comes 8:16 into the sixth overtime period for a total of 108:16 of overtime. It is the third quarter-final game (best of seven) in the Kölnarena in Cologne in front of an audience of 17,000. The game had begun at 5:30 pm and ends at 12:15 am. March 12, 2017: Joakim Jensen of the Storhamar Ishockey ends the longest hockey game in history, scoring with 2:46 left in octuple overtime for a total of 157:14 of overtime, and 217:14 of hockey played. It was Game 5 of the quarter-finals of the 2016–17 GET-ligaen playoffs against the Sparta Warriors in the CC Amfi. About 1,000 out of the 5,500 people that attended the game watched the entire game. The game started at 18:00 and ended at 2:32 the next morning. The longest game in AHL history is game four of the 2018 Atlantic Division Final on May 9, 2018. The Lehigh Valley Phantoms beat the Charlotte Checkers, 2–1, at Bojangles Coliseum on a goal by Alex Krushelnyski at 6:48 of quintuple overtime. Alex Lyon was the winning goaltender for the Phantoms, making 94 saves. The University of New Brunswick Varsity Reds needed 61:53 of overtime (four extra periods) to defeat the Acadia University Axemen 3–2 on February 27, 2011 in game two of a best-of-five AUS semi-final series at Fredericton, New Brunswick. Nick MacNeil scored the game-winner at 11:53 of the seventh period overall. York University Lions and Lakehead University Thunderwolves went to a fourth overtime period (50:13 minutes of overtime) on February 14, 2007 in Thunder Bay, Ontario, to decide a winner in OUA men's playoff hockey action. Lakehead won the game at the 13-second mark of the fourth overtime period. Morgan McHaffie scored at 17:14 of the sixth overtime period to lead the Queen's Golden Gaels to a 2–1 win over the host Guelph Gryphons in the first game of the best-of-three OUA women's hockey final, March 2, 2011. The game, which lasted 167 minutes and 14 seconds, including 107:14 of extra time, is the longest on record in CIS or NCAA hockey – women's or men's. Winning goaltender Mel Dodd-Moher made 66 saves, while Danielle Skoufranis made 44 saves in a losing cause. It is the longest game ever played sanctioned by Hockey Canada. On May 12, 2008, one of the longest games in IHL history, if not the longest, took place in Fort Wayne, Indiana. It was the seventh game of the Turner Cup Final between the hometown Fort Wayne Komets and Port Huron Icehawks. The game was tied 2–2 through regulation. The first two extra periods solved nothing, but 23 seconds into the third overtime period, at some point after midnight ET, Justin Hodgman scored the winning goal to give the Komets their fifth Turner Cup title. It was the club's first since 1993, and their sixth overall, with their last championship being the Colonial Cup in 2003. The Komets would win again the following year with an easy game five victory at home, which was the first time in franchise history they won back-to-back championships. They would follow up with a third consecutive Turner Cup in 2010, again clinching on home ice, securing a dynasty. On April 25, 2018, in game 5 of the 2018 VHL finals, SKA-Neva defeated HC Dinamo Saint Petersburg 4-3 in a game that needed 103:36 of overtime to be settled. Svyatoslav Grebinshchikov scored the game-winning goal 3:36 of sextuple overtime. The longest game in NCAA hockey history was played on March 6–7, 2015. UMass beat Notre Dame, 4–3, in the Hockey East first-round playoff game after 91:42 of overtime. Shane Walsh scored the winning goal for UMass. The longest game in NCAA hockey history was played at Notre Dame in South Bend, Indiana on March 6, 2015. UMass beat Notre Dame, 4–3, in the Hockey East first round with 8:18 left in quintuple overtime. Shane Walsh scored the winning goal just after 1:00 am local time. The previous longest was played on March 12, 2010. Quinnipiac University beat Union College, 3–2, in the ECAC Quarterfinals, as Greg Holt scored with 9:38 left in quintuple overtime. The 3rd longest game in NCAA hockey history was played on March 5, 2006. Yale University beat Union College, 3–2, in the ECAC Hockey League first-round playoff game after 81:35 of overtime. David Meckler scored the winning goal with Yale shorthanded. The longest game in NCAA Division III hockey history, and the fourth longest in NCAA history overall, began at 7:05 pm on February 27, 2010 and ended at 12:35 am of the following day. Gustavus Adolphus College beat Augsburg College, 6–5, to advance to the MIAC championship game after 78:38 of overtime. Eric Bigham scored the winning goal. A March 30, 1991 game between Northern Michigan University and Boston University ended with Northern Michigan earning an 8–7 victory over Boston University. Unlikely hero Darryl Plandowski scores in the third overtime period and fifth hour of play to give the Wildcats the title. 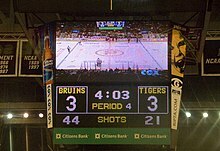 A March 8, 1997 game between Colorado College and the University of Wisconsin–Madison ended with Colorado College winning, 1–0, after 69:30. A March 14, 2003 ECAC Quarterfinal game between Colgate University and Dartmouth ended, 4–3 for Colgate, after 61:05 in overtime. On March 26, 2006, the Wisconsin Badgers beat the Cornell Big Red 1–0 at 11:13 into the third overtime at the Midwest Regional Final in the NCAA Tournament at the Resch Center in Green Bay. It was the second-longest NCAA Tournament game in its history and the longest 1–0 game in tournament history. It is currently the ninth-longest game all-time in NCAA Division I history. An March 11, 2007 game between St. Cloud State University and University of Minnesota Duluth during the first round of the WCHA playoffs ended with SCSU winning, 3–2, after 51:33 of overtime. It is the eighth-longest NCAA Division I game in history. In the first round of the 2008 WCHA hockey tournament featuring the fourth-seeded Minnesota State University, Mankato Mavericks hosting the seventh-seeded University of Minnesota Golden Gophers, the Friday and Sunday games both went into double overtime, and the Saturday night game went into one overtime. The Gophers prevailed two games to one in the series, winning Saturday and Sunday. On March 3, 2012, in the first round of the 2012 ECAC Hockey hockey tournament featuring the seventh-seeded Clarkson Golden Knights men's ice hockey team hosting the tenth-seeded RPI Engineers men's ice hockey team, Clarkson beat RPI 4–3 at 13:48 in the third overtime period, after 113:48 of play. It is currently the seventh-longest game all-time in NCAA Division I history. On March 10, 2007, Wisconsin defeated Harvard, 1–0, in an NCAA Women's Quarterfinal game after 67:09 of overtime at the Kohl Center in Madison WI. Wisconsin went on to win the national championship. On March 10, 2012, Cornell University defeated Boston University, 8–7, in an NCAA Women's Quarterfinal game after 59:50 of overtime at Lynah Rink in Ithaca, New York, surpassing the men's game from the previous night as the longest hockey game to be played at the rink. On March 21, 2010, Minnesota-Duluth defeated Cornell 3–2 in the NCAA championship game, after 59:26 of overtime (119:26 total game time), the longest men's or women's hockey championship game in NCAA history. The longest game in Memorial Cup history was played on May 23, 2014 in London, Ontario, where in the semi-final game, Curtis Lazar scored at 2:42 of triple overtime as the Edmonton Oil Kings beat the Val-d'Or Foreurs 4–3 to advance to the championship game. The entire overtime lasted 42:42, the overall game time played was 102:42. The longest game in WHL & CHL history was played on April 2, 2017 in Victoria, BC, in Game 6 of Round 1 between the Everett Silvertips and Victoria Royals. Cal Babych scored with 8:24 left in quintuple overtime to beat the Royals 3-2 to win the series 4-2. The total game time played was 151:36. The longest game in QMJHL history was played on April 3, 2016 in Boisbriand, Quebec, where in a first-round game, Philippe Sanche scored with 7:34 left in triple overtime as the Blainville-Boisbriand Armada beat the Val-d'Or Foreurs 3-2 to advance to the quarterfinals. The entire overtime lasted 52:26, the overall game time played was 112:26. The semi-final game for the 2007 RBC Cup, saw the host Prince George Spruce Kings taking on the Camrose Kodiaks. The game ended up being the longest game in Royal Bank Cup history at 146 minutes and 1 second. The Spruce Kings broke a 2–2 tie just over six minutes into the fifth overtime period to win 3–2 and clinch a berth in the RBC Cup Final against the Aurora Tigers. Jason Yuel of the Spruce Kings scored the winner while goaltender Jordan White stopped 91 of 93 shots for the victory. On February 10, 2007, the Toronto Jr. Canadiens defeated the Pickering Panthers, 4–3, to take a 2–0 series lead in the first round of the OPJHL playoffs, after 104:32 of overtime. It is the second longest game ever played sanctioned by Hockey Canada. Marquette vs Orchard Lake St Marys went eight overtimes during the Michigan State Ice Hockey Division 1 Championship game before Tournament officials stopped the game in consideration of the health and welfare of the players on March 8, 2008. The 1–1 tie resulted in the two teams being declared co-champions. The game lasted 109 minutes. Ryan Morley Stockton of St. Mary's had a MHSAA-record 58 saves. The longest game in high school history was in a 1996 FCIAC quarterfinal matchup in Darien, Connecticut between archrivals Wilton and Ridgefield that went to a tenth eight-minute overtime period after 45 minutes of regulation (125:00 of hockey). Chris Ludwig of Wilton scored the game-winner while being hauled down in front of the Ridgefield net in the tenth overtime period. The previous record belonged to the Aurora High School–Solon High School game in which Aurora won in the eighth overtime period of the Ohio state playoffs. The winning goal was scored with 3:52 left in the 8th overtime (105th minute), setting an American record. Since 2015, all state tournaments allow up to 5 overtime periods (4-on-4 after first overtime), after which best-of-3-round shootouts and extra rounds if needed are conducted, to eliminate co-champions. ^ "World's first regular season NHL overtime game". Thelongestlistofthelongeststuffatthelongestdomainnameatlonglast.com. Retrieved February 17, 2014. ^ a b "AHL extends OT to 7 minutes, adds 3-on-3 portion". Rochester Democrat and Chronicle. ^ "Board of Governors approves changes for 15-16". Retrieved August 26, 2018. ^ Rosen, Dan (June 24, 2015). "Board of Governors OKs 3-on-3 OT, coach's challenge". www.nhl.com. National Hockey League. Retrieved June 25, 2015. ^ a b "2017 IIHF SPORT REGULATIONS" (PDF). www.iihf.com. International Ice Hockey Federation. May 2016. Retrieved January 6, 2017. ^ "New OT format at Worlds". International Ice Hockey Federation. Retrieved April 15, 2019. ^ Jeff Z. Klein, "Hockey Night in Europe: Goodbye, Columbus", New York Times, October 25, 2008. ^ V. Lychyk, "English borrowings in recent Soviet Russian", Papers and Studies in Contrastive Linguistics 29 (1994), p. 153. ^ "Format & Rules". Iihf.com. Retrieved February 17, 2014. ^ "Panthers outlast Capitals in longest NHL shootout when Nick Bjugstad scores in 20th round". NHL.com. December 16, 2014. Retrieved January 15, 2017. ^ Teams played a 10-minute "regular" overtime period, followed by 15-minute "extra" overtime periods. The winning goal was scored at 13:52 of the fourth "extra" overtime period. Montreal Gazette, March 29, 1930, page 20 and Toronto Daily Star, March 29, 1930, page 10. ^ This was the second game of a two-game total-goals series. Montreal won the first game 1-0. Chicago won the second game 2-1, making the aggregate score 2-2. Sudden-death overtime was used to break the tie, and was considered part of the second game. Teams played a 10-minute "regular" overtime period, followed by a 30-minute "extra" overtime period, and another "extra" overtime period. The winning goal was scored at 11:43 of the second "extra" overtime period. Montreal Gazette, March 27, 1930, page 16. ^ Teams played a 10-minute "regular" overtime period followed by a continuous, unlimited, sudden-death overtime period. The winning goal was scored at 35:35 of that period. Montreal Gazette, March 21, 1930, page 18. ^ "Hertl, Sharks believe heading into Game 7". April 21, 2019. Retrieved April 22, 2019. ^ Potts, Andy (April 8, 2019). "East: Avangard goes to the Gagarin Cup final. April 8 round-up". KHL.ru. Kontinental Hockey League. Retrieved April 9, 2019. Bondarev finally stopped the clock on 109:18 and the first Gagarin Cup finalist was known. ^ "Resume: CSKA - SKA : Kontinental Hockey League (KHL)". en.khl.ru. ^ "7.03.2015 23-й ОЧРБ. 1/2. Гомель 1 - 2 от Юность". hcgomel.by. ^ "Verdensrekord på Hamar i natt – Storhamar vant etter 8 timer og 32 minutter". www.vg.no. March 12, 2017. ^ "Хоккей. Чемпионат ВХЛ. Плей-офф. Игра номер 74 25 апр. 2018: Динамо СПб-СКА-Нева (онлайн трансляция)". online.vhlru.ru. ^ "Almanac ... Longest Games". College Hockey News. Retrieved March 7, 2015. ^ "Men's Hockey Defeats Augsburg 6-5 in Four Overtimes, Sets NCAA Record For Longest Game In Division III History - Posted on February 28th, 2010 by Tim Kennedy". Athletics. ^ "Rougeau's Triple-Overtime Game-Winner Sends Women's Hockey to Frozen Four". Cornell University Athletics. Retrieved March 10, 2012. ^ Mary Buckheit (March 17, 2008). "After eight overtimes, is a tie wrong?". Sports.espn.go.com. Retrieved February 17, 2014. ^ "MHSAA: Games-2008 Ice Hockey Tournament". www.mhsaa.com. ^ "2007 State Ice Hockey Tournament Results". www.ohsaa.org. ^ "The Remaining Top 24 High School Sports Stories of 2007 – cleveland.com". Archived from the original on March 4, 2016. Retrieved January 1, 2019.